Increasingly competitive industrial environments are challenging warehouse and distribution center managers to reduce costs and increase productivity, while raising quality and safety standards. 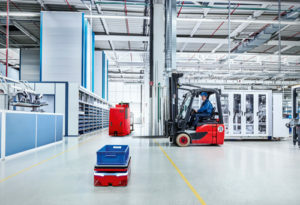 For facilities that cannot cost-justify a full conversion to completely automated unit load handling equipment, incorporating backup sensing technologies on forklifts can help maximize their efficiency. 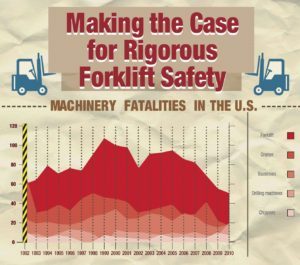 That’s because adding active systems, such as backup sensing solutions to manned forklifts can reduce the risk of a forklift collision with objects behind the forklift, such as personnel, products, machinery or structures. There has been a growing interest by end users to equip manned forklifts with this technology on either new or existing equipment. No matter when the backup sensing technology is installed, its proper application and use, in combination with the driver, reduces collisions and minimizes downtime and expense associated with an accident. Why use automated technologies on manned trucks? Even though forklift drivers are trained to always look in the direction of travel (and to travel in reverse if the load blocks their view), they may not do so consistently. There may be one or more blind spots, i.e. areas in the direction of travel that the driver cannot see without extra effort. To mitigate these risks, many companies have installed some type of object detection system, particularly on the back (non-fork) side of a manned forklift. These devices are intended to compensate for driver errors and eliminate costs associated with accidents. Two primary types of backup sensing technologies are available: passive and active. Passive camera systems include a box camera mounted on the back of the forklift. The images it records are transmitted to a viewing monitor in the cab of the forklift. This allows the driver to see what is behind the forklift without physically turning around. However, the driver has to make the judgment about when to apply the brakes. Other passive systems project a highly focused beam of light, or a laser, from the forklift onto the floor at a set distance away from the forklift. The light is intended as a visual cue for pedestrians that a forklift is approaching, alerting them to react appropriately. However, the light does not interact with static obstacles, such as facility structures, products or other equipment. Another example of a passive system is the “reverse buzzer,” which most forklifts have integrated onto the machine. While this is commonly used and simple and easy to integrate, it is “always on” when the forklift is being driven in reverse. This provides good feedback to nearby personnel to minimize potential collisions; however, this annunciation does not help with static objects in the forklift’s path. Those collisions will still occur. A wearable active warning system has been introduced that uses a proximity antenna, but there are some limitations since it requires a transponder “tag” to be worn by all personnel. In addition, an in-cab unit must be installed within each vehicle to read the personnel’s tag. If a person does not wear their transponder and enters the detection zone, an alarm will not be triggered. It is designed to reduce accidents between workers and vehicles, but placing tags on pallets and racks may not be feasible. 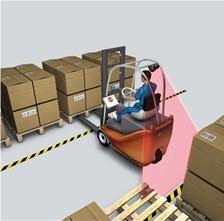 Alternately, active-sensing devices such as laser scanners continuously monitor a specific area behind the forklift. The technology projects a beam of infrared or invisible light away from the forklift. If the light encounters a surface, the surface reflects the light back to a sensor in the scanner. Internal converters and decoders interpret the collected information, utilizing intelligent algorithms to evaluate the field. These calculations determine the location of the obstacle relative to the position of the device on the forklift. Completely configurable, the projected eye-safe, invisible, 2D laser plane is capable of monitoring a rectangular or radial zone typically up to a 26-feet (8-meter) range in a 270° field of view to monitor the areas where obstructed views are present for the driver. The laser scanners that are easiest to implement include push button control for easy teaching of detection areas, or zones. This means the user defines the dimensions of warning (and/or stopping) zones interactively—by putting the scanner in “teach mode” and walking the desired field’s shape in front of the scanner. Alternately, zone programming can be drawn using a graphical interface integrated with the scanner’s control software. Once the teach-in process is complete, the scanner returns to an active monitoring mode. When the system detects an obstacle’s configured field, it triggers a warning to alert the driver to stop the forklift. Some systems provide 1- and 2-zone warnings (approaching a collision versus collision is imminent). The warning(s) could be a flashing light, horn, buzzer, bell, alarm, chime, or a combination (in 2-zone detection systems) of these. Also, these laser scanner systems can potentially be wired to the forklift’s stop circuit, triggering the forklift to automatically slow or stop if an obstacle is detected. Additionally, laser scanners generally operate regardless of ambient light, reflective surfaces, dirt, dust, reliability in detecting various object colors and ambient noise immunity, but we suggest checking with the laser scanner supplier to verify this. Some can also be used in an operating temperature range of 14° to 122° Fahrenheit (-10° to 50° Celsius) for cold storage applications.